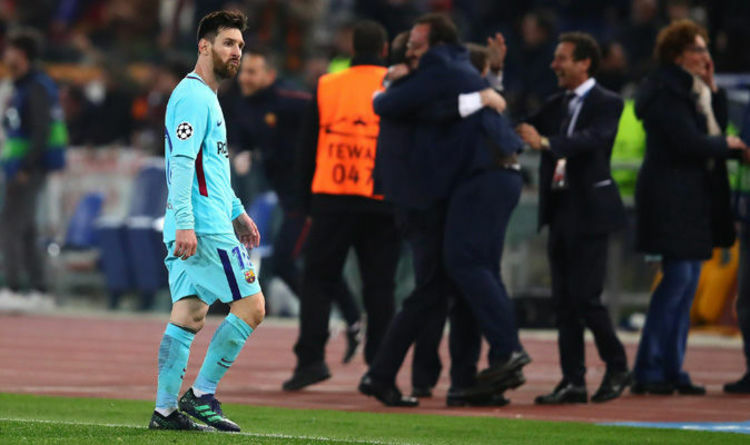 Barcelona have been dumped out of the Champions League after a shocking 3-0 defeat at the hands of Roma – and Lionel Messi certainly wasn’t happy about it. The Argentine hero failed to make an impact on the game as Barcelona threw away their 4-1 aggregate lead from the first leg. Messi left the field looking devastated as the Roma players, fans and staff celebrated around the Stadio Olympico. Edin Dzeko, Daniele De Rossi and Kostas Manolas bagged the trio of crucial goals to send Barca crashing out of the tournament. Messi will now be desperate to tie up the La Liga title before turning his attention to the World Cup this summer. Take a look through the gallery to reveal the best snaps of Lionel Messi after the final whistle.